Forest Department Jobs 2018 is announced. The advertisement for Forest Department Jobs 2018 is come on today newspaper Roznama Express. Forest Department Jobs 2018 for Grade(Pay-Scale) 1 to 4. Forest Department of Rawalpindi require a applications for jobs in simple paper before 15 September 2018. The recruitment for Forest Department Jobs 2018 is according to the Govt. policy of 2004. Interview are conducted on 25 September 2018 for Rawalpindi, 26 September 2018 for Murree, 28 September 2018 for Attock. 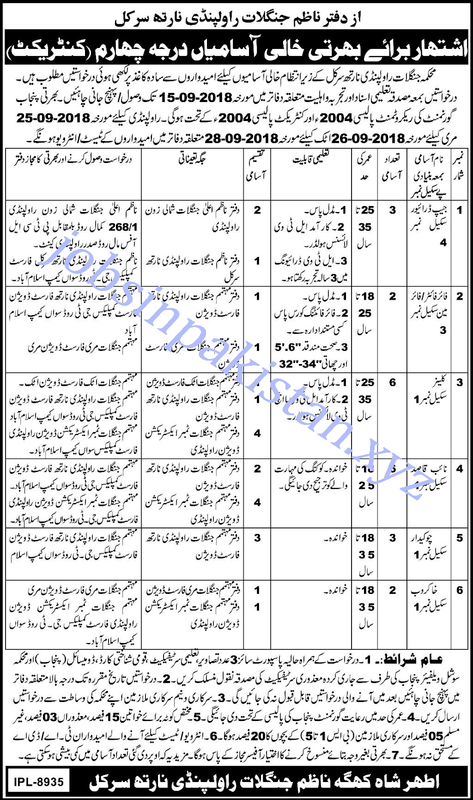 Forest Department of Rawalpindi require a applications for following jobs.